These are simple Baked Japanese Sweet Potatoes that are perfect for a quick carbo fix. There's no sugar added because the Japanese sweet potatoes are naturally very sugary. Preheat the oven to 425˚F/220˚C. Lightly oiled or butter a baking dish. 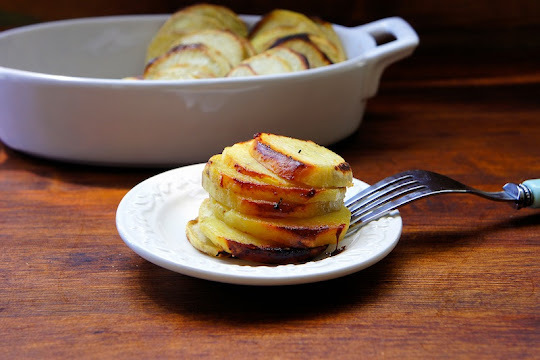 Slice the potatoes (about ¼ inch) and toss with melted butter, garlic powder, onion powder, and sea salt. Arranged the seasoned sweet potatoes sideways on a baking dish. Bake the potatoes for about 30 minutes or until lightly brown in color and fully cooked. Serve warm or at room temperature.